At its re:Invent conference in Las Vegas, AWS today announced a small but significant update to its S3 cloud storage and Glacier cold storage service — and how developers can access data in them. 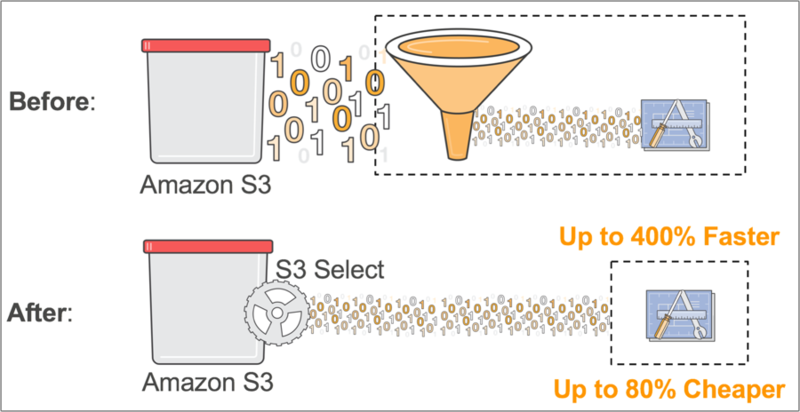 As AWS CEO Andy Jassy noted in his keynote, the company’s customers tend to store much of their data in its S3 storage service, despite the fact that AWS also offers plenty of database and data lake services.They essentially use S3 as their data lake. Often, though, when its customers want to only needs parts of the data in an object that sits in an S3 bucket. Say you want data about one of your retail stores but that sits in one large object. With this new service, these developers can now use standard SQL expressions to query this data within objects stored in S3 and Glacier. Jassy noted that on S3, this new service, dubbed S3 Select (and Glacier Select on the cold storage side), can improve data access performance by up to 400% because you don’t have to pull the complete object out of storage and then run your queries after that. This feature is now live for both S3 and Glacier users.